Whoever tried to push themselves to stay motivated knows that it takes consistency, persistency and a driving force. And it’s darn hard on an individual level, not to mention implementing employee motivation techniques. Keeping employee motivation high can be a complicated puzzle. According to the Gallup’s State of the American Workplace Report, only 33% of the US employees feel engaged. Yet, it is important, as it can increase job satisfaction and organizational commitment. Being a software development company, we think that keeping employees happy is especially important for us, as the mobility of IT specialist is very high (69% of IT professionals plan to look for a new job in 2017 to advance their career). So how does motivating help? According to AlienVault, 65% of IT pros who decided to stay in their jobs, did that due to their happiness at work. And as engaging employees proved to help creating happy workspaces, we’ve decided to bet on that crafting our employer branding strategy. Leadership style – determines employee motivation level and how they feel about the company. The reward system – the benefits an organization offers to their employees. The organizational climate – describes how employees treat each other. The structure of the work – aligns the nature of work with employees. Let’s now discuss how we’ve implemented these four elements at Apptension. A leadership style is the key factor determining people’s well-being and the attitude towards the company. At Apptension we usually go with team leadership (participating) which allows every team member to be a part of the process and be equally involved and responsible for the final decision. When discussing a new project, everyone can suggest technologies we might use, as long as they can back it up. Leadership style is crucial as the change of the team leader may not only change the vibe, but also performance of the team. We take great pride in our unique reward system: an internal crowdfunding platform. Each of our employees has a monthly budget that can be spent on any idea they want to bring to life. They can either contribute to other employees’ initiatives or set up their own, for the collective good that they can also take advantage of. It also has a vital meaning for our employer branding campaigns performance. We also value our long-term employees by giving them a gift and a word of appreciation in front of all colleagues when they have a work anniversary. We put a lot of effort into making our work environment a great space to be. Our office is not only area to work, but it’s also for people to share their passions and hobbies. After all, we spend a lot of time here. When we moved to our new office it was a big, shiny and empty space. We had to make it more friendly and conducive to productivity, but also a fun place to stay after work. Finally, we’ve implemented 6 office redesign ideas to make our office a happy workspace. But our organizational structure is not only about the space, but also the way we treat each other. We follow the rule of mutual respect and we believe that every conflict can be resolved with a positive impact on both sides. From project management point of view, we worship Agile, but the structure of work takes more than daily standups. Routinized and repeatable habits can lead to effectiveness but also boredom or feeling down. That’s why it’s so important to have a structure that is well-balanced, having as many opportunities to work productively, as well as having occasional small talks in the kitchen. As a team we use Slack to communicate, discuss our daily lunch choices and pick the board games to play during our next team retreat. We do have daily morning standups, but we like to make it fun, by tossing a fluffy toy from one person to another. Our new employees are asked to write a few words when they join team and in the first day, lunch is on us. We have lots of small habits that make our culture special, the atmosphere of selflessness and enjoying our time together as a team is what our employees value a lot. Apptension team during Color Run. The above mentioned factors can help creating an engaging workplace. But can they be used also for integrating employees during the after-work activities like running? Finishing these three steps was a piece of cake, the biggest challenge was to keep the level of motivation high. As a captain I knew I have to run regularly to set a good example. After all it was my idea to take part in the Color Run. I didn’t want to disappoint my team. Running and comparing our results, praising ourselves for the progress and exchanging tips made me realize that we had created a micro community focused around not only running itself, but also healthy lifestyle in general. At Apptension we have few micro communities like Magic: the Gathering fans, FIFA players, board games lovers, people ordering certain types of lunches on certain days of week even! In the ideal world I would assume everyone had at least the same level of motivation as I did, but some of us ditched regular trainings after only one run. I didn’t want to push anyone, I know how it feels to be a couch potato. So I did made some subtle suggestions from time to time, just to fulfill my captain duty. I think this approach was good after all – all people stood up at the starting line, regardless of the engagement. Form a leadership style that resonates with your core values and strategy. Decide on a reward system incentivizing your employees. Inspire your employees with shared organizational values. Structure the work in correspondence to your employees’ nature. 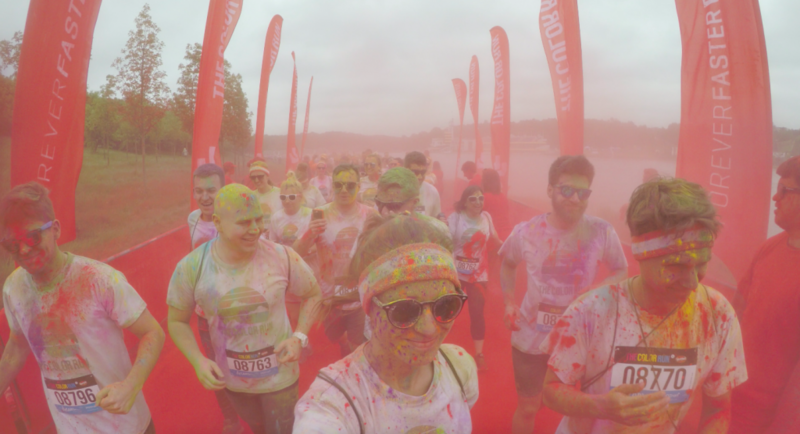 We’re using these methods in day-to-day work at Apptension, but also to foster camaraderie during after-work events like Color Run. Not pushing people too much. Tracking progress (with a mobile app for example). Praising one another for achieving individual goals. It worked for us, and I encourage you to try the same with your team. 2 years as Marketing Ops, analytics junkie, detail-oriented master of chaos management and digital marketing (which are practically the same). In her free time she watches movies in bulk and do fitness on a trampoline. When it comes to improving employees’ skills and knowledge sharing, there’s always room for innovation. Here’s how we did it with our internal hackathon. Recruiting the best developers is a lifeblood of every software house. Here's how we used employer branding for hiring IT professionals. If you had to guess what is it that programmers hate the most, what would you say? We've surveyed Apptension devs to find out what they don't like the most.